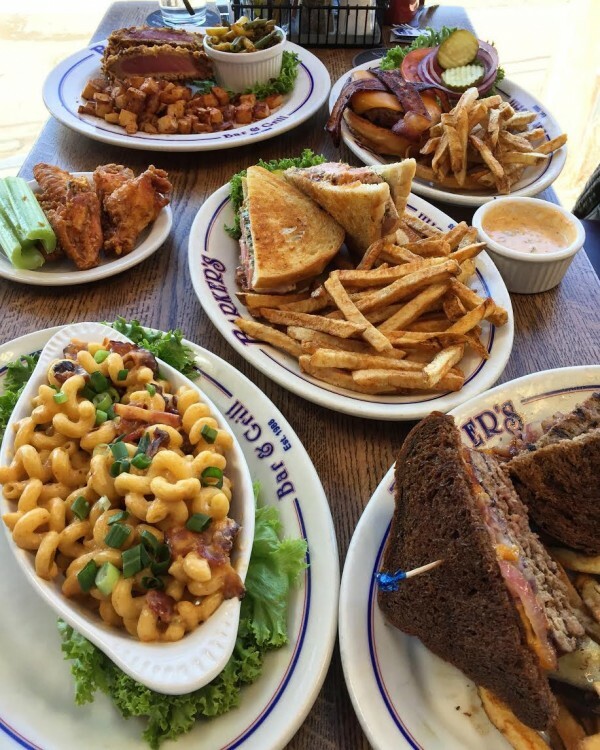 Bar food at its finest; There is some seriously good grub over the river in Hudson, WI – along with some fantastic people that greet you with genuine enthusiasm. Marty at Barkers Bar & Grill took me under his wing from the moment I walked in until my departure. 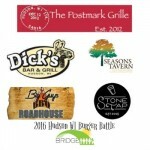 For a bar, I had some damn good service and some wonderful food to go along with it, check it out. Going off of the suggestions from the general public that frequent this joint, so definitely giving these a go! 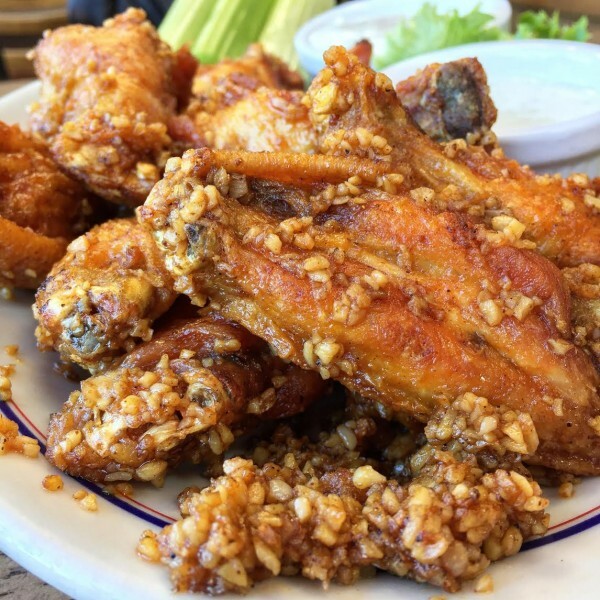 Garlic-Creole Wings – The locals know these as “Beer Wings.” Sautéed with sweet butter, fresh garlic and a combination of Creole spices. These are fresh and crisp, just how I like my wangs! Now you would think upon seeing this much garlic, that is all you would taste, nope! Not over powering at all, and the taste is phenomenal. No overwhelming garlic breath lingering either. Date night approved. 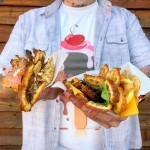 Next up is their Patty Melt – Charbroiled burger, caramelized onions, cheddar and Swiss cheeses, atop grilled rye bread. I went ahead and made this a double, it made me feel more in control of things. 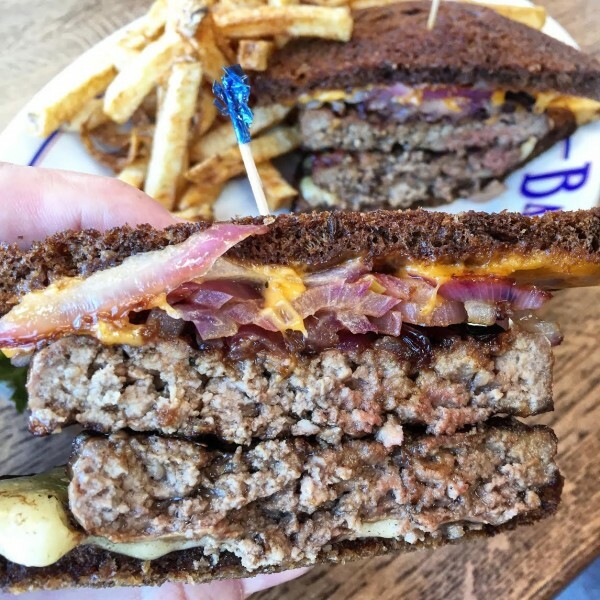 Now I don’t like my beef more than medium, so this was bit overdone for my liking, but still a good tasting Patty Melt. 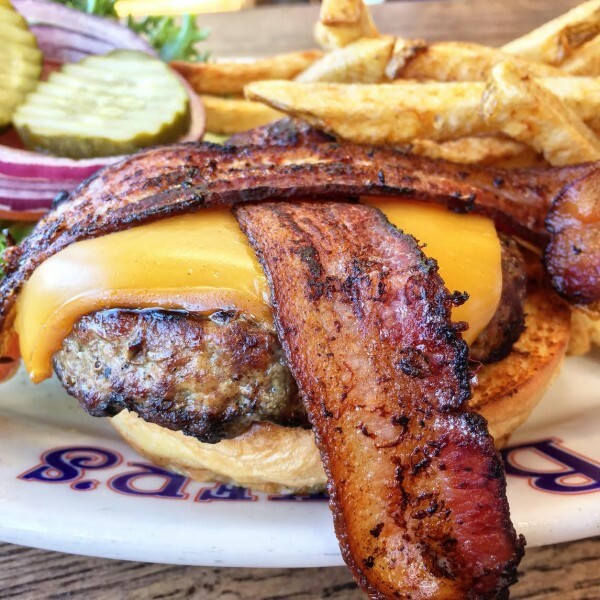 Bullseye Burger – topped with Barker’s smokehouse BBQ sauce, smoked cheddar cheese and crisp, hickory-smoked bacon, and locally sourced lettuce, tomato and red onion. Yummy smoky stuff right here. Now we are eating! This has my name written all over it. 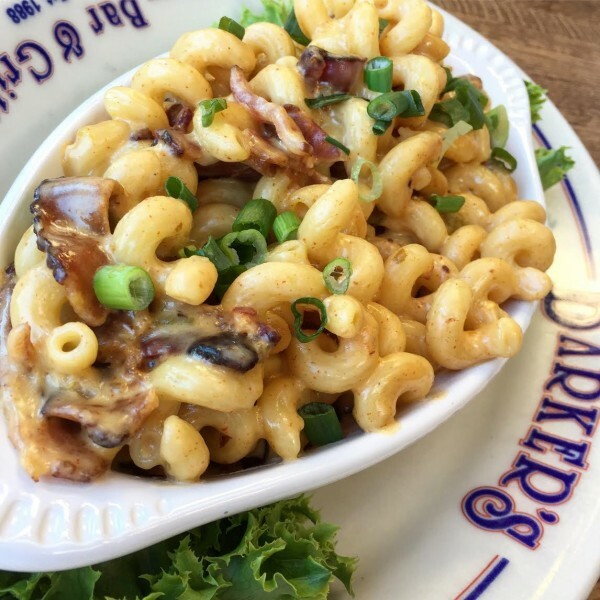 Barker’s Smoked Green Chile-Bacon Mac & Cheese – smoked green chiles, hickory smoked bacon and cavatappi pasta topped with their house-made queso. 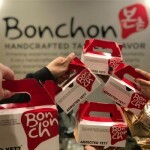 I really love the smoked flavors along with the zestiness of their queso. 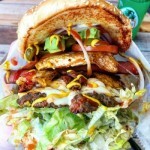 I’m ordering this atop a burger next time! There just happens to be a unique featured item here at Barker’s and guess what? Yup, I ordered it! Crunchy Ramen Ahi Tuna – 6oz center-cut Ahi Yellow Fin Tuna Steak breaded with crunchy ramen noodles, flash-fried to a perfect medium-rare and glazed with their house teriyaki sauce. Served with a side of togarashi spiced potatoes (chili flakes, orange zest, sesame seeds and seaweed powder) and curried green and wax beans. So as I was preparing to feast on this Asian-creation I immediately thought I was going to break a tooth. It felt like it was made out of legos in my hand. However, that wasn’t the case, it had the normal crispness of like- something coated with panko deep-fried or even a crispy fried chicken…and it actually worked. I just wish it had a spicy mayo dipping sauce. It’s a special, so get it soon. By the way, these were the most flavorful green beans I’ve ever had. Now I was told I couldn’t leave this place without trying their tuna melt, who am I to turn down some more grub? Bring it on! 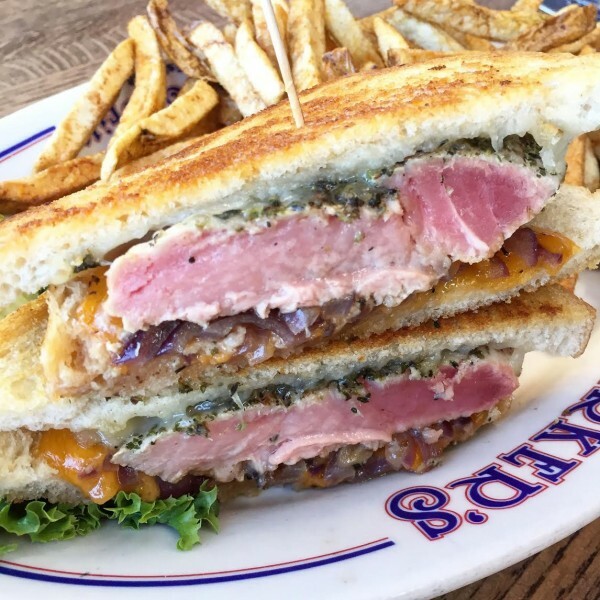 Dan’s Yellow Fin Tuna Melt – 6oz center-cut Pacific-fresh Ahi Tuna steak, seasoned and char-broiled medium (or to your liking). Topped with melted sharp cheddar, Monterey Jack and caramelized onions, served atop grilled sourdough. This is a fantastic tuna melt, and I made the mistake of not ordering it Tucson style, with their scratch pesto and oven roasted tomatoes, because I was thinking it was your typical green processed pesto, but it’s not. 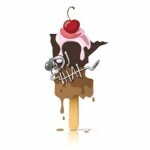 I got a side of it, and it drastically changed this Melt for the better. It was actually red and had a depth of flavor. Even got a side of it to take home. 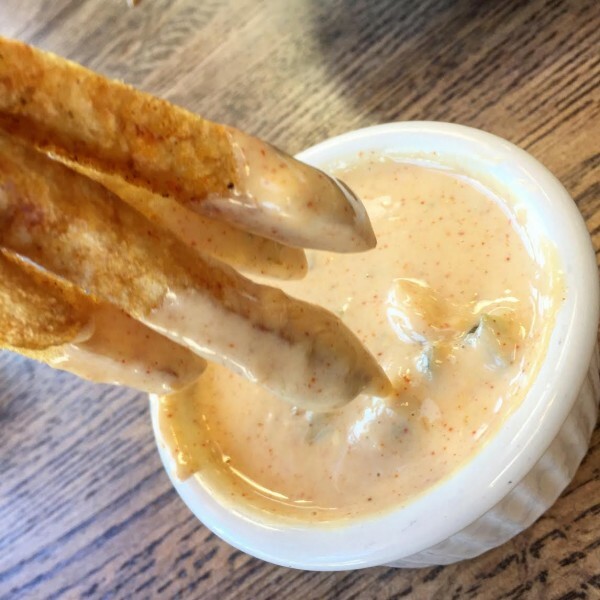 Barker’s hand cut fries in their home-made queso, dipping just one fry does no justice. Does anyone just eat one fry at a time? Just like the locals that frequent here and have been telling me that I must try, I’m telling you to come pay this place a visit and hopefully you won’t get ridiculed for waiting so long. 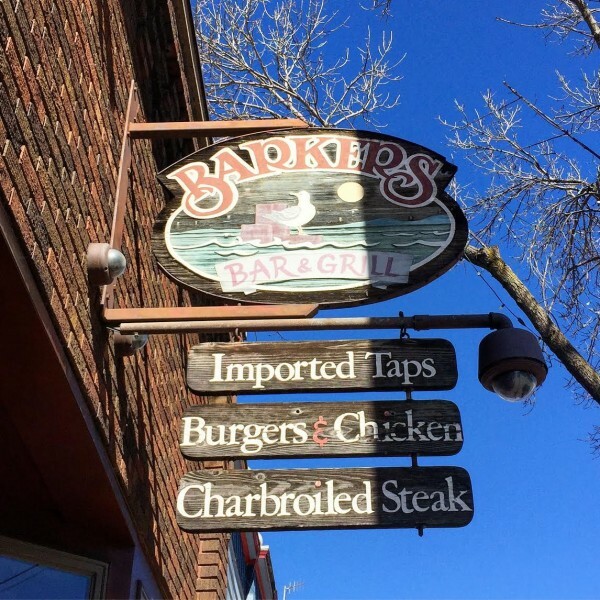 You can find Barker’s Bar and Grill at 413 2nd Street, Hudson, WI or visit their website. 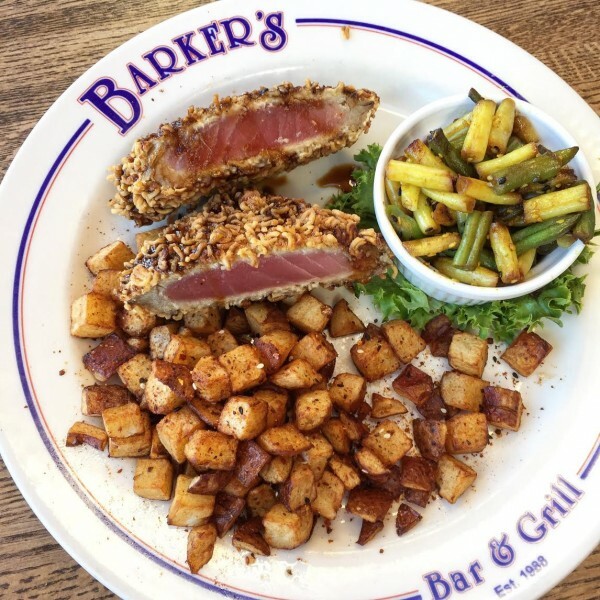 You can also check Barker’s Facebook page for daily specials. 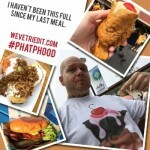 Follow @phatphood on Instagram to see what I eat next.